According to Keywest Technology, the next generation of Breeze not only improves the efficiencies of its SaaS-based digital signage system but also provides a greater wow-factor experience. We realize that digital signage connects two very human experiences—and they both must be great. Keywest Technology is keeping its New Year’s resolution by announcing today the release of its second-generation Breeze digital signage system. According to Keywest officials, their second-gen technology clearly lays all of their cards on the table in anticipation of exceeding both user expectations and ultimately the viewers’ experience. 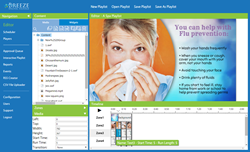 The Breeze 2.0 makeover includes over 15 software improvements and enhancements plus hardware updates that address the total digital signage experience. During its year of development, “simplify, simplify, simplify!” became the mantra of Keywest’s president and director of technology, Nick Nichols. This becomes self-evident when viewing the Breeze 2 digital signage editor (i.e. user interface, UI) for the first time in your favorite browser. First-gen Breeze users will immediately notice the absence of the dashboard home page, the navigation panel, and static UI graphics. Instead of opening a dashboard screen cluttered with a palette of options, the Breeze 2 UI gets down to business quickly with an inviting, unpretentious overview of the editor masterfully shaded in the soothing colors of blue and green. It also uses HTML5 coding that sizes the Breeze UI automatically to your browser’s resolution, either on desktops or mobile platforms. The Breeze 2 user experience is greatly simplified by using only one screen that changes elements as needed with different icon selections, hiding inactivated parts. This means no more wait time for new screens to open, no shuffling back and forth between windows, and easier to find playlist management options. The Breeze 2 playlist options are not only easier to find, but they have also become easier to use, too. For example, every media file, from the Media Group (content folder) to Media Zone (template builder), can now be batched processed with a handy new feature called MULTI-SELECT. Rather than selecting one file at a time for processing as in the past, MULTI-SELECT enables users to apply the same settings to any number of files at once. This saves considerable time when adding, editing or even deleting media files. Another improvement is the enhanced widgets. Take the text widget for example. It now comes with 700 fonts that even support in-between font sizes! Access to the text tool is a simple click on the Widget icon. Additionally, any of the dozen or so built-in widgets (e.g. clocks, weather bugs, RSS news feeds, etc.) that use text may be quickly changed by a double-click over that widget’s text area, which opens the text tool for quick updates and personalization. “We realize that digital signage connects two very human experiences—and they both must be great. The first experience happens in the UI when the digital signage manager puts together the creative bits into a timeline that creates a compelling short story,” explained Nichols. The viewer experience Nichols speaks of has to do with another significant improvement of Breeze 2. It is no longer shackled to specific hardware. Breeze 2 sports a new media engine that runs entirely on HTML5, meaning that it is PC operating system agnostic. This opens the doors for Breeze to run on any existing hardware or platform, such as Android, Apple, Linux, Microsoft or embedded system-on-chip (SoC). With three successful years of software-as-a-service experience in the rearview mirror, the second generation of Breeze maintains its roots in the cloud but loses it ties to an outmoded user interface design and experience, adds many viewer enhancements in the form of data-driven widgets, and spreads its adaptability by being hardware agnostic, working on existing PC/player platforms or running on SoC digital displays. Interested parties are encouraged to contact Keywest Technology (800-331-2019) for a free 30-day trial. Breeze 2 is sold and distributed through Keywest’s network of professional AV and IT resellers. Breeze 2 product information may be found at BreezeDigitalSignage.com. Keywest Technology is an authentic developer of digital signage technology and a full-service provider offering solutions from simple playback to large multi-sign and interactive networks. Keywest builds marketing communication systems with a holistic approach that includes key software technologies, creative design, system design, and comprehensive network-managed services. Based in Lenexa, Kansas, the company is dedicated to making business communication as enjoyable as a day at the beach. For more information, visit http://www.KeywestTechnology.com.